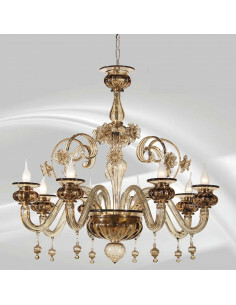 Classic and elegant Murano glass chandelier, handmade according to ancient Murano technique. 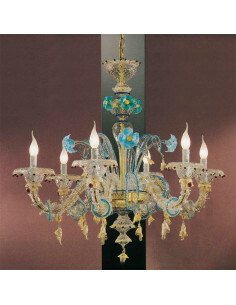 Classic and elegant crystal-gold chandelier, with light blue, blue and ruby decors, handmade Murano glass according to ancient Murano technique. 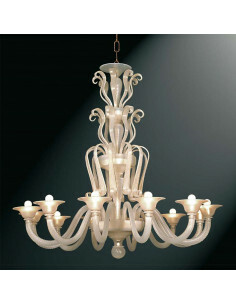 "Rezzonico" chandelier transparent white silk, with only two pastoral ladders. Customizable in both color and number of lights. 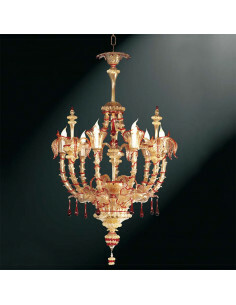 "Rezzonico" chandelier transparent all over gold with decorations and ruby red pendants. Customizable in both color and number of lights. 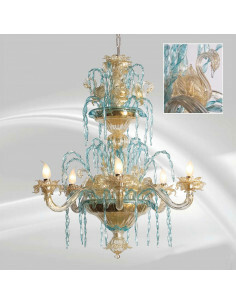 Chandelier with wide resonon ceiling and water body color all over gold and green wire. Customizable in both color and number of lights. 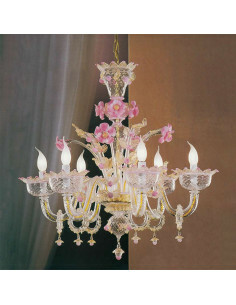 Handmade Murano Glass Chandelier, adorned with leaves and flowers as of ancient Murano tradition, pink gold crystal with pink and blue flowers. Possibility of customization by choosing the number of lights and color. 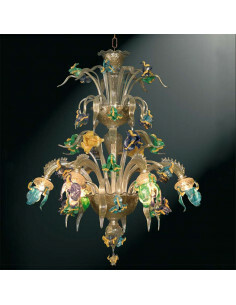 Transparent Murano glass chandelier with gold, green, blue and pink decorations, handmade as it is from ancient Murano tradition and adorned with leaves and flowers. 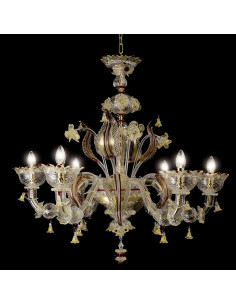 Handmade Murano glass chandelier adorned with leaves and flowers as of ancient Murano tradition, gold crystal with pink details. 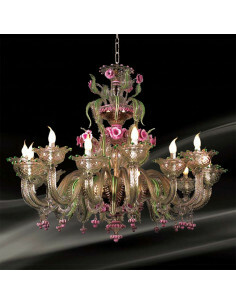 Classic Murano glass Venetian chandelier handmade by Murano glass masters in green rose gold crystal, enriched by multicolored palm leaves and flowers. 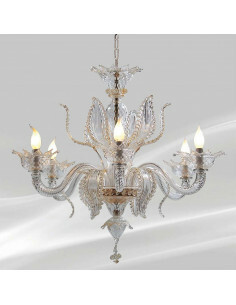 Murano glass art chandelier handmade according to the millennial technique of muranese glassmasters. 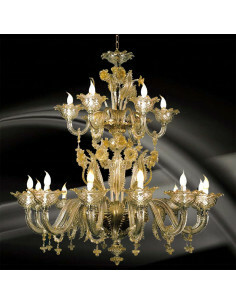 The "Atene" chandelier is a true work of art: 6 lights with stage in gold with flowers and details in colored pasta. 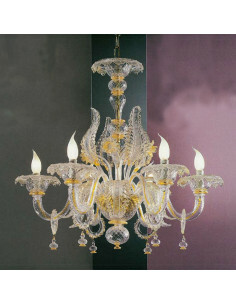 Handmade Murano glass chandelier adorned with leaves and flowers as of ancient Murano tradition. Possibility of customization by choosing the number of lights and color. 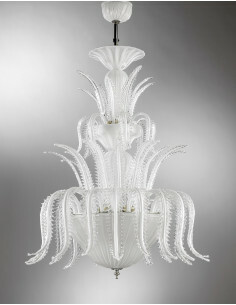 Murano glass art chandelier handmade according to the millennial technique of muranese glass masters. 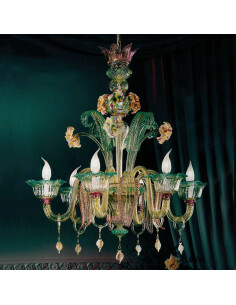 The "Corinth" chandelier is a true work of art: 12 lights with green gold crystal glass and pink and green pasta details, enriched by flowers and pendants made exclusively by hand. 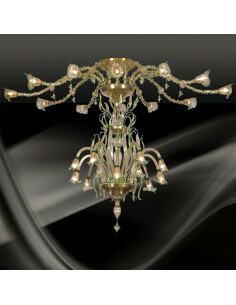 Classic Venetian Murano glass chandelier handmade by Murano glassmasters, enriched by leaves and flowers. 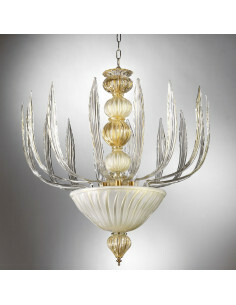 Artistic Murano glass chandelier handmade according to the ancient technique of Murano glassmakers. 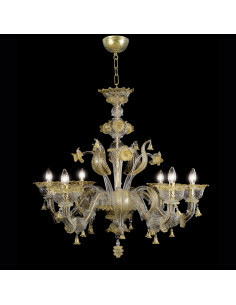 The chandelier "Ca 'Rezzonico" (see picture) is a true work of art, with its internal structure of pure gold, crystal glass / gold, enriched with flowers and pendants exclusively handmade. 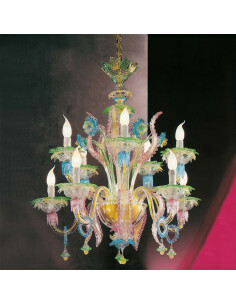 Murano Glass Suspension made by hand according to the millennial technique of Murano glass masters. 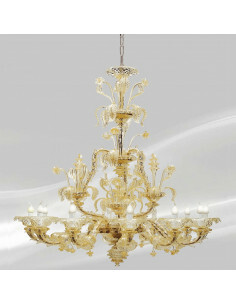 Suspension is a true work of art and consists of 16 golden crystal leaves and alternating balls in gold and ivory.